Not too long or too short, these beautiful shoulder length haircuts for ladies fall at the perfect spot! 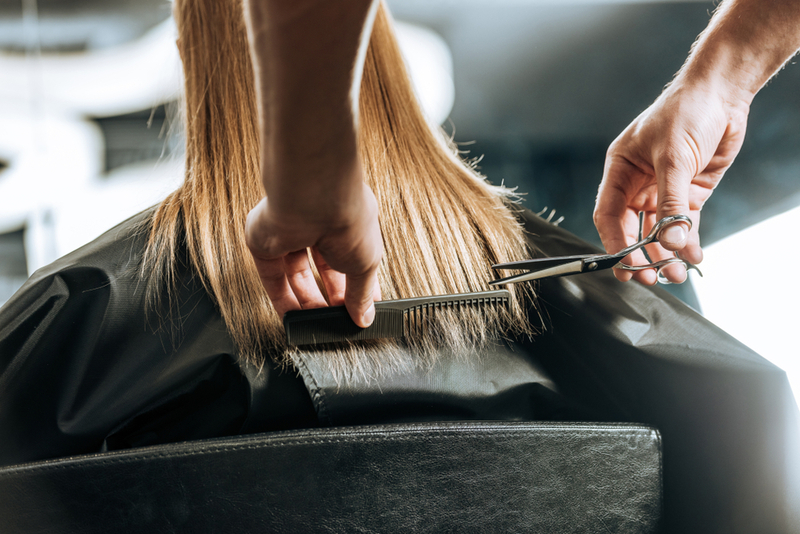 If you want to chop off your long hair or you are in the process of growing out your short hair; shoulder length hair will allow you to rock numerous styles. Wavy and chic, straight and sleek, or curly and neat, you will get one of these shoulder length haircuts ideal for your style and personality. Take a look here for more inspiration. Choose one and take it to your stylist to style it for you. Nothing showcases sophistication and chic more than this shoulder length haircut. Whether you are looking for the hairstyle that will take you from weekend shopping to Monday business meeting, this is an ideal look to consider for your needs. A subtle parting at the centre with beautiful tousled layers that flow to the shoulders is a beautiful way to rock a shoulder length hairstyle. 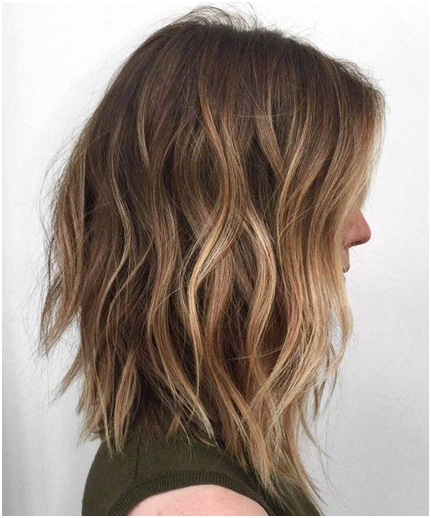 The light hue makes this haircut one of the most beautiful shoulder-length haircuts this year. If you haven’t tried it, you might be losing a lot of fun out there. An effortless yet gorgeous look for women with short, medium hair. A neat low ponytail gives you an opportunity to show your face and keep your hair aside if you like going to the gym or you are an athlete. Simply use your hairband to enhance the hold of your style. It is as straightforward as such to rock this glam look. This is usually the most straightforward way to style medium length hair. So if you are looking for an easy and cute haircut at the same time which also gives you hassle-free maintenance, this could be an ideal choice for you. The messy shoulder-length style with natural base gives you the needed texture and dimension required for a super killer look. This is the most comfortable and fashionable way to wear your weave. Start by placing your locks on one side and style those layers and some waves to come up with a flattering finish. Stay feeling amazing and looking soft with these substantial waves that look superb on medium to long hair. These are also ideal canvas if you want to experiment with the ombre style. Are you looking for an appealing yet youthful and trendy haircut for your wedding? Twists will be a perfect pick for you. They work well for all hair types especially if you also include highlights to enhance dimension to your twists. Complete the look in a bun and style some loose tresses in front for a beautiful look. 8. Beautiful Light Brown Colour. This sweet and beautiful brown bob flatters on any hair texture and hair type. It is common hairstyle sported by most celebrities thanks to its versatility in styling. The style gives your hair an illusion of thicker and healthier hair regardless of the method you use to style it. Thus, it will be a good style for women with thin hair. This list of shoulder length haircuts cannot be complete without this style. The pastel pink look will give you the confidence to try everything. Achieve your dreams by trying this fantastic, dazzling hue that looks great on all hairstyles. 10. Dark Espresso and Curly Hair. If you are blessed with curly hair, this is perfect shoulder length hairstyle to try. It is simple yet gives you a lively appeal. It is also a great style if you want to give life to your bouncy and bulk curls. The style will style allow you to reveal your beautiful natural curls. 11. A Bob for Curly Hair. 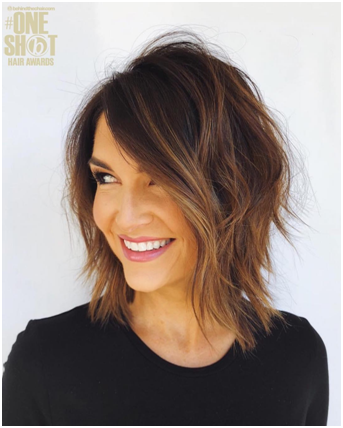 Embrace your confidence by opting for this shoulder-length bob for curly hair. Note that moisturizing your hair is primary to make your locks lively and give them the required bounce.